Without a doubt, my favorite non-puerta cerrada in Buenos Aires is Olsen. I didn’t have extremely high hopes for it going in, since many blogs cite it as a past-its-prime place for expats rather than Argentines. To be fair, I did go there once with 5 other Americans for a round of pre-boliche drinks. However, the other two times I’ve visited (once for drinks and once for lunch), I only heard castellano spoken. Even if Olsen is filled with expats, rest assured they are chic, young expats befitting the gorgeous setting, and not fanny-pack wielding tourists with crying babies. The architecture of Olsen is clean yet interesting, with a variety of settings for different situations. 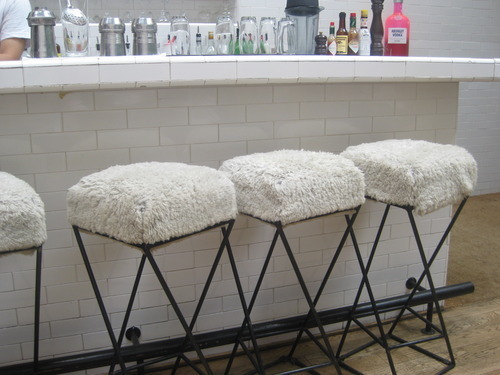 In the mood for a cozy chat over a couple of G&T’s with close friends? There is a fire pit in the middle of the restaurant, perfect for intimate conversation. 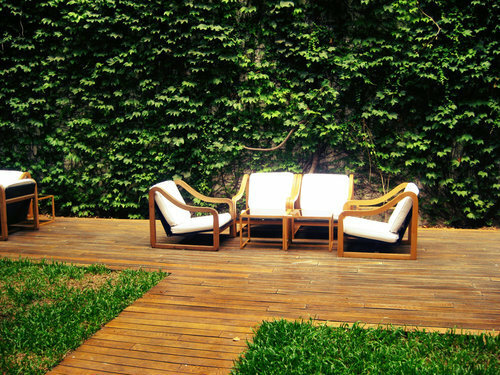 For those seeking a romantic setting, the outdoor garden space is ideal for grabbing a pre-dinner drink with a significant other. The few tables on the second floor provide an eagles-eye view of the restaurant and the grounds, although those tables may be better for those enjoying dinner and not too many drinks, as the stairs up to them are rather vertiginous. The drinks at Olsen are all traditionally made with Absolut, as it is a Scandinavian restaurant (Sidenote: I have found that Grey Goose is an anomaly here… Weirdly, many places only have Absolut or Skyy). My favorite drink was the delectable Pink Flamingo, crafted in front of me using generous chunks of fresh grapefruit and mint leaves. Both times I ordered it, it was refreshing and sweet (but not too sweet). Beware that it was also quite strong. For drinkers accustomed to Manhattan prices, Olsen is a bargain. Their specialty cocktails cost approximately $8 USD each according to the official price, or $5.50 USD at the blue market rate. In NYC, artisanal cocktails of this caliber easily run $20-$30 USD each at a comparably chic restaurant. 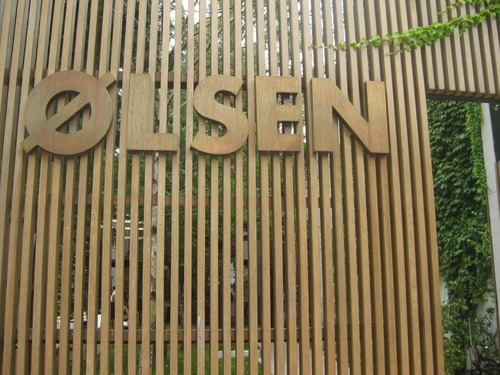 Although I would most recommend Olsen for its drinks, the lunch which I had there was also very good. In a country synonymous with steak, it was a genuine delight to find a tofu wrap on the lunch menu. 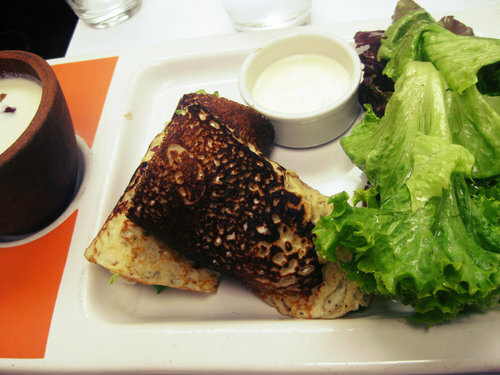 The tofu came wrapped in blini, and was served with a side of white bean gazpacho with nuts and greens. I didn’t love the white gazpacho, but the tasty tofu more than made up for it. I also enjoyed stealing some of Gareth’s home fries, which were perfectly golden and just the right balance of crispy and soft. 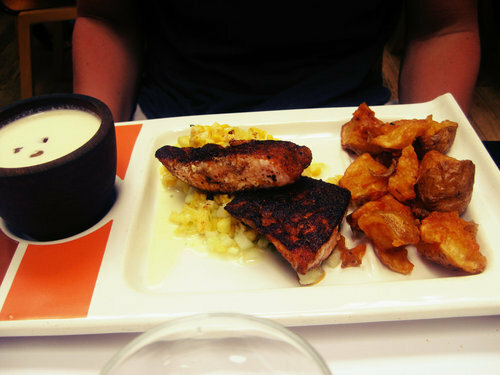 He also had ordered the white bean gazpacho to compliment his main entree of salmon. Gareth is not one to typically order fish, but he only had good things to say about his pescado treat. I am definitely planning to come back to Olsen one more time for drinks, or maybe even a full dinner. In a country where a restaurant’s aesthetics tend to take a backseat to food quality and/or price, it is refreshing to visit a good, reasonable restaurant with a design scheme as strong as its vodka drinks.